At the foot of the Montgrí Massif, between the villages of Bellcaire de l'Empordà and l'Escala, touching the protected area of ​​the Montgrí Park, you will find the Mas Santa Caterina in the small neighborhood called Sobrestany. Sobrestany, known for its disappeared Animal Park, which closed doors in 2008, is a small neighborhood of about twenty houses, away from the road and with magnificent views over Montgrí and the plain of the Bay of Roses. Despite belonging to the municipality of Torroella, Sobrestany is closer to L'Escala. The road that leads to it has very few traffic and is only used by residents. The small town is ideal for excursions to the Massif of Montgrí, for excursions to the East Coast (including Cala Montgó and the paradisiacal beaches accessible only on foot, such as Cala Ferriol). Very few minutes separate Sobrestany from the magnificent beaches of Empúries and the Bay of Roses, or from other towns such as Torroella, L'Estartit or Verges. The property consists of two independent houses destined to residential housing. The first one, the Barn, is the old haystack refurbished about twenty years ago and updated in 2016. 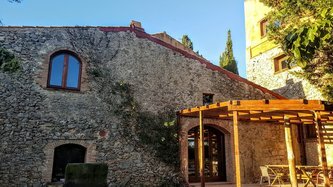 The second, the Masia, is the oldest part of the property. The two units can be rented jointly or separately for a maximum of 16 guests. 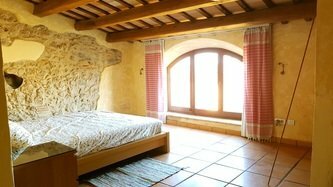 The Barn of Santa Caterina in Sobrestany is a 145 square meters property renovated in 2016. 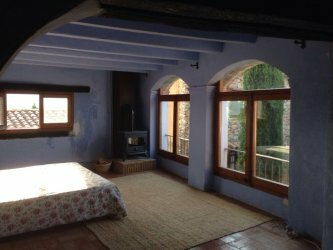 It has a large double room on the first floor with a full bathroom, a room with a bunk bed on the ground floor, a mezzanine with two beds, another bathroom with shower, and a large living room with kitchen. The barn has access to the garden, where the also shared pool is. Sobrestany is a small village of about 20 houses close to the most important spots of Costa Brava, including cities like Girona and Figueras and the beautiful beaches of Empuries and l'Estartit. The plain the small village of Sobrestany overlooks is perfect for bike rides, and the hills and mountains on the other side of the village are perfect to be explored by foot. The nearest village is Bellcaire (1,5km), even though l'Escala (4km) and Torroella (10km) are more dynamic and offer also many shopping possibilities.